Blink and you miss it. Never has there been a more apt saying, than with the moving of the Crèche of Compassion. It can’t really be said to be a surprise, but the Crèche was moved backwards on Monday, quietly and without any real fanfare. Which is surprising, as the NZTA are normally keen on a bit of good PR. I’m most annoyed, because I actually physically walked past the site of the crèche twice yesterday, and didn’t notice anything – and apparently it was moved in between times. Morning – still there. Afternoon – moved. Chance for Maximus and the public to observe actual moving procedure – nil. But all is not lost. It has to be moved at least twice again. It doesn’t seem to have been moved all the way back, so it has a little bit more of that journey. Then it also has to be moved in the Z axis, upwards. And then again, it needs to be moved sideways, to get to the final resting place. What is interesting to me, is that it was moved, quietly, just as the Basin Bridge Board of Inquiry seem to have been waking up to the realization that the Crèche move is not needed by the War Memorial Tunnel work, passed under urgency a year ago, but is only being moved now to facilitate the potential new Basin Bridge, which doesn’t even have permission yet. If I have read the reports correctly, the Board have been trying to ascertain the legality of the dividing line between the War Memorial Park work, and the Basin Bridge work, with the Crèche obviously sitting so closely to the edge of both. With things being the way they are, and The Board moving at such a glacial pace, it is no surprise that in the intervening confusion, NZTA just slipped in and moved it anyway. You snooze, you lose. Of course, the way I read it, NZTA included the moving of the Crèche in the works to the War Memorial Park, which was passed under urgency, without having to have a Resource Consent hearing, so that they would have an unencumbered route for the Flyover from Hell to land back on earth at precisely the point where the Crèche was inconveniently sited. How embarrassing it would have been if the Crèche wasn’t moved, and the whole Flyover was permitted, and yet the Crèche was still sitting there, subject to a Resource Consent application. Imagine the loss of face if the (considerable) heritage effects of the Crèche remaining on its site (the one it has very recently vacated from), and the new Flyover traffic having to go round it…. Actually, the Board of Inquiry pretty much established conclusively today that the Crèche is / was / has been sitting outside the War Memorial Park zone until yesterday, and that they have no real legal right to be moving the building. BOI – really? You sure about that? If so, I wonder if they will have the balls to tell NZTA to stop doing things illegally, and to stop the move? Or even – to put it back where it was…..! It’s like training a bad dog. “Stop it… Stop it, No. Put that down now. Put it back where you found it. No, no…. Leave it – leave it…. Good boy! “. The Board of Inquiry states re the Crèche of Compassion – Duncan Kenderdine (Construction Manager for the Alliance for WM Park construction) notes that: The question of relocation is an intent by the government for the crèche to be seen as part of the War Memorial Park, and was part of the empowering Bill for the Park passed by the Government. The Government desires that the Crèche be part of the War Memorial Park for the enjoyment by future generations. The Act provides for relocation of the building into the Park. The relocation has been subject to a Heritage plan, with drawings for the relocation by Studio Pacific Architecture. Review document by Andrew Stewart Ltd. The Board of Inquiry notes that the question of exactly Why it has been shifted Now, when the Bridge has not been consented, has not been answered. Gee, the creche is within the Land Requirement Plan for the roading designation in the NMP Empowering Act, there are designation conditions about its relocation, and the wording of the NZTA designation is wide enough to drive a truck through. Seems “included” in that Act to me. The Basin Reserve “match-fixing scandal” could be the biggest scandal yet, if anyone cared. There’s far too much dodgyness here. “The New Zealand Transport Agency has strongly denied claims it broke the law in order to improve its chances of getting resource consent for the Basin Reserve flyover. The agency has been accused of unlawfully moving the 100-year-old Home of Compassion Creche out of the flyover’s proposed path before a board of inquiry had a chance to make a call on whether the $90 million highway should get resource consent. In doing so, the agency executed an “elaborate ploy” to ensure any harm done to the heritage value of the creche by moving it could not be counted against the flyover, opposition groups say. The issue has emerged as the latest weapon those groups are wielding to prevent the agency’s proposed two-lane flyover, 20 metres north of the Basin, from going ahead. 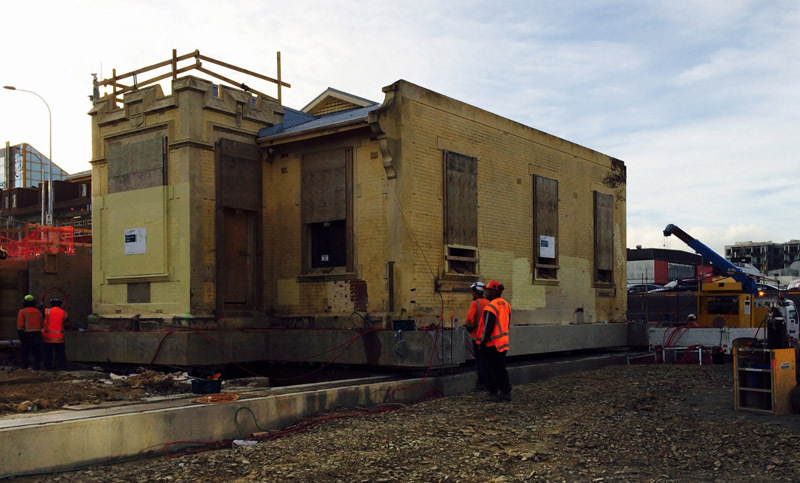 The agency began moving the heritage-listed creche from its Buckle St site earlier this week. It will eventually come to rest 15 metres west of its old site. From there, the new National War Memorial Park will be built around it. Because the creche’s move is now a fait accompli, the flyover board of inquiry cannot include it in the list of pros and cons that will inform its final decision. What i think is quite intersting about all this, is that the Heritage bods are now getting quite excited about the Creche, and how it must stay sitting alone, as it has done for the last few years, with nary a skerrick of context. But as can be seen in the photo on the last post, it’s natural context was actually to be surrounded by Catholicness and buildings. It is, if you like, perverse for it to be seen on its own. So we should really clutter up its surroundings really, shouldn’t we, to keep it company?